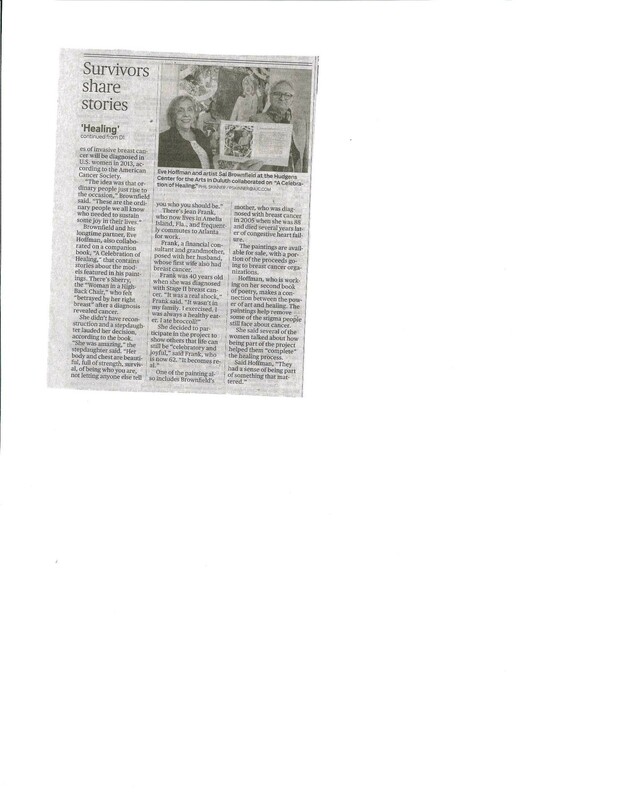 Click here to see the Aurora Theatre Release for WIT including Celebration of Healing exhibit and ticket information. 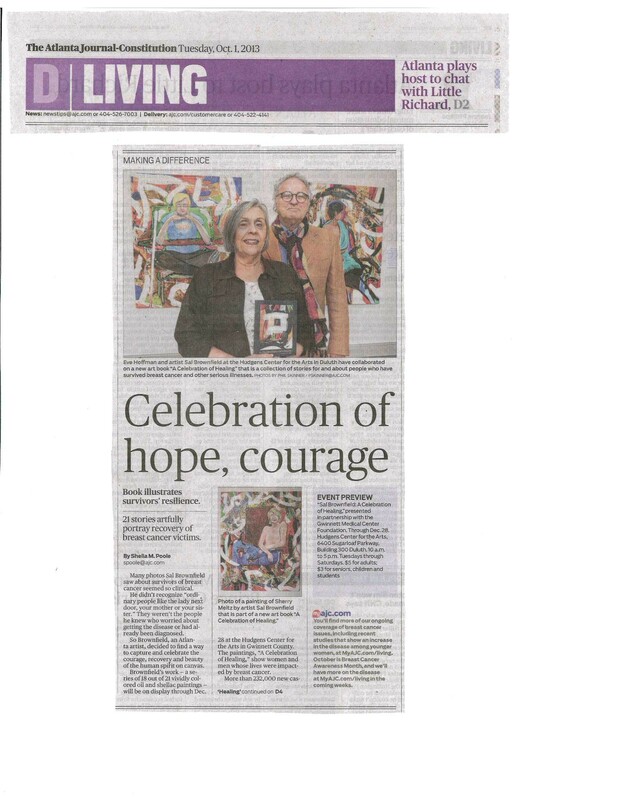 Click here to see Sal Brownfield’s article about creating the Celebration of Healing Paintings from the January 11 series from Saporta Report. 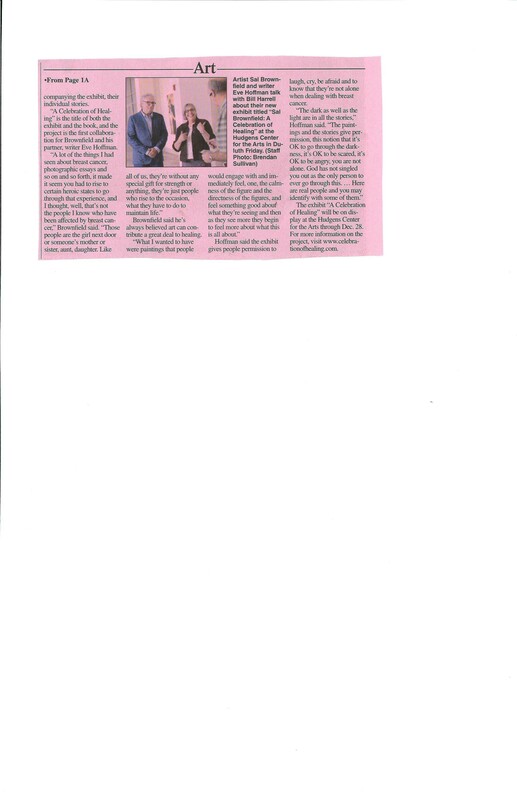 Atlanta Journal Constitution Living Section, page 1 October 1, 2013 Click on images to enlarge. The Hudgens Center for the Arts in Duluth has a new art exhibit featuring a local artist opening on Tuesday, September 24, entitled, “Sal Brownfield: A Celebration of Healing,” presented in partnership with the Gwinnett Medical Center Foundation. The exhibit will remain on display through December 28. The “Sal Brownfield: A Celebration of Healing” exhibition features 16 extraordinary portrait paintings by Brownfield accompanied by stories about the subjects, all breast cancer survivors. 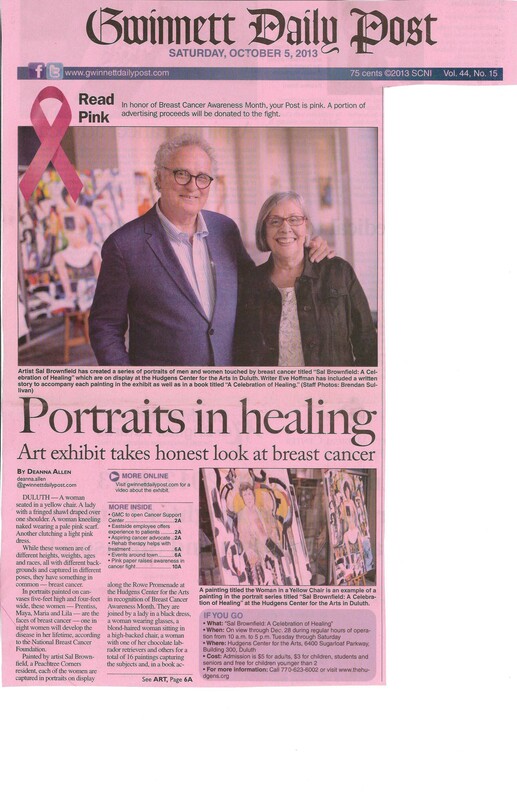 A Peachtree Corners, resident, Brownfield began with a series of paintings of breast cancer survivors, but as he worked with his subjects to create the paintings, he came to know the individuals and their powerful stories, and realized that their stories needed to be captured. Writer Eve Hoffman was brought in to interview each individual and began writing their stories, and the idea for a book, “A Celebration of Healing,” was born. There will be an opening reception for the Sal Brownfield exhibit on Tuesday, October 1, from 7:00 to 9:00 p.m. The opening will be free and open to the public, and copies of the “Celebration of Healing” book will be available for purchase in the gift shop. On Saturday, October 12, there will be a free Family Day at The Hudgens, featuring an Artists Talk and book signing by Sal Brownfield from 10:00 to 11:00 a.m., and then hands-on art activities from 11:00 a.m. to 1:00 p.m. Admission to the Hudgens will be free all day. The Brownfield exhibit is presented in partnership with the Gwinnett Medical Center Foundation (GMCF), which is hosting a Cancer Survivors Celebration and Grand Opening of the new Cancer Resource Center at GMC on Tuesday, October 29. At 5:00, Brownfield and Hoffman will be available at a Book Signing, with a Reception and Tour to follow. Passes to visit the Brownfield exhibit at the Hudgens will be given away at this event. The Hudgens Center for the Arts is a non-profit organization that has been focused on supporting the arts in Georgia since its establishment in 1981. The Hudgens presents fine art exhibits year round, and offers art classes for adults and children through its Fine Arts School. It supports local community-based arts organizations through its programs, exhibits and partnerships. The Hudgens’ mission is to bring art lovers, leaders and learners together through quality programs and exhibits. The Hudgens Center for the Arts is located at 6400 Sugarloaf Parkway, Bldg. 300, in Duluth, in the Gwinnett Center complex. For more information about art exhibits, events and classes at the Hudgens, please visit the website at www.thehudgens.org or call 770-623-6002.